80% of unexpected challenges and delays in marine projects is cable failure. Cable failure creates risks for losing expensive subsea equipment. 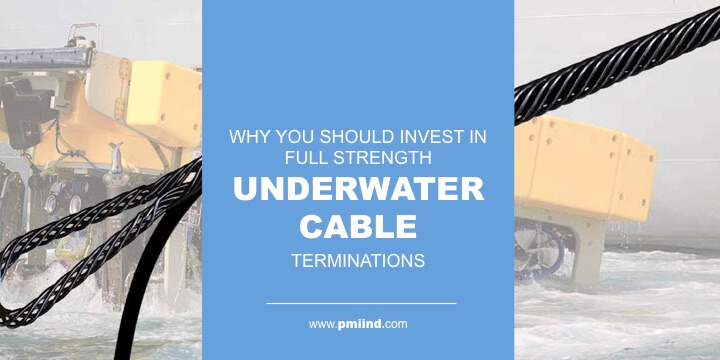 Full-strength underwater cable terminations prevent cable failure during deployment and retrieval of subsea equipment. A benefit of the helical wire design permits easy installation of the termination anywhere along the length of the cable and does not require access to the cable end. Can be easy installation anywhere along the length of the cable and anywhere in the field. Do not require tools or cable preparation. More subsea projects are happening than ever before, and ROVs, side-scan sonars, and other offshore equipment are almost always an element within them. When equipment like ROVs and side-scan sonars are deployed or received, the twisting and bending of the cable at the termination point is common. Side-scan sonars and ROVs need these cables to stay intact and be able to bear the weight of the equipment. If these cables can’t keep up, it will cost serious delay and expense to projects. Cable failure is the cause of 80% of unexpected challenges and delays. The most common instance happens when subsea equipment is deployed from a vessel or retrieved from the sea and fails due to an extreme amount of tension being placed on the attached subsea cables. If these delicate cables are not terminated properly, they experience damage from strumming and snap loading. At this point, your crew can find themselves spending a good day starting over with installing a brand new termination – costing your project valuable time and money. Without a proper underwater cable termination or grip, all of the stress and tension is concentrated along the cable where it is attached to the equipment. This is a ton of localized stress on what is usually a very expensive mechanical, electrical, or optical cable. Without a full-rated strength termination, you could be creating a recipe for disaster – cable damage, or worse, a cable break that results in the loss of expensive equipment. Helical terminations are designed to function similarly to a Chinese finger trap — a childhood toy that is a woven paper tube letting you place a finger into each end, and then, as you try to pull your fingers out, the tube tightens around your fingers. The harder you try to pull, the tighter the tube grasps your fingers, creating a secure hold. Helical terminations work the same way. Helical rods are wrapped around the subsea cable at the termination location of the undersea equipment. With a helical termination, all of the stresses that would occur at one localized point on the cable are spread out over the length of the cable wrapped with the helical rods; therefore, greatly reducing the stress on any specific location of the cable. To be technical, axial loading, a force that passes through the center of an object, causes elongation of the helix (or cable) and results in radial contraction. This compressive force gives the helical rods its ability to hold force. If you hold one end of the helical rod and attempt to pull the cable out, you transfer the load from the cable to the helical rods. If at any point the load increases, the holding force increases. This mechanism provides a gradual transition of the load from the cable into the helical rod until the helical rods carry the full axial load. A benefit of the helical wire design permits easy installation of the termination anywhere along the length of the cable and does not require access to the cable end. Many times attachment points are needed along the length of the cable. A good example of this is for creating an attachment point for the cable to be lifted from the seabed. Unlike other helical terminations, PMI’s grips are built to hold your subsea cable to the full-rated breaking strength. When you are working with some of the most advanced and extremely expensive machinery in the industry, you can be confident that PMI’s equipment protects yours better than any cable hardware on the market today. Permit easy installation anywhere along the length of the cable and anywhere in the field. Come furnished in galvanized steel. Other materials, such as stainless steel, are available upon request. Work with many jacketed and synthetic strength members. PMI’s Cable Grip and Stopper Grip Terminations are an inexpensive investment for preventing damaged cables or replacing a lost piece of expensive robotics. PMI underwater cable terminations have been used on cables for over 50 years, preventing subsea cable damage and maintaining cable integrity. PMI offers Cable-Grip, Stopper-Grip, and EverGrip Terminations that all utilize Helical Rods. Not sure what your project needs or have more questions about our helical terminations? Ask one of our experts today to help.